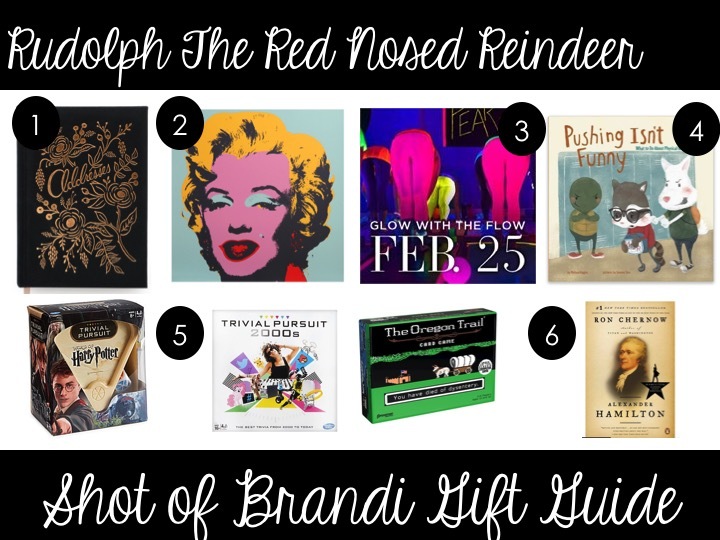 Rudolph the Red Nosed Reindeer is one of those classic songs that was turned into a television special...or was it the other way around? Regardless, this song inspired some fun gift ideas. 1. To keep track of all of these people you “know,” it sounds like you need an address book. I love this one from Rifle Paper Co! 2. I was trying to think of who, in my opinion, was the most famous person in the world. The only name that jumped out was a celebrity who shall not be named on this blog (K family has E! Reality show), so I went to Google. It told me that the most famous person is Marilyn Monroe. And that’s how I ended up on this Marilyn Monroe Warhol! Call me crazy, but a little over $1,000 is lower than I expected for an authentic Warhol! 3. I know, I know. Gifting someone an exercise class can come across offensive, but for the yogi in your life (in Pittsburgh) Amazing Yoga has an upcoming “Glow With The Flow” class that combines techno music, yoga, heat and a blacklight! 5. Rudolph needs to take things into his own hands with some new games. I love adding a board game to my list because honestly wine, snacks, beer and a board game are totally my ideal Saturday night. I’ve got my eye on Trivial Pursuit Harry Potter edition, Trivial Pursuit 2000s, and the Oregon Trail card game. 6. I do love to give someone the gift of a book (not on an e-reader). Typically history books are boring, but this year Hamilton is rather “hot,” so how about the book Alexander Hamilton.